The Kansas City Chiefs hired Romeo Crennel as their head coach after the interim coach brought home 2 wins out of 3 during his short tenure as interim coach. Romeo Crennel was head coach when the Chiefs beat the Green Bay Packers, relieving them of their perfect season in week 15. 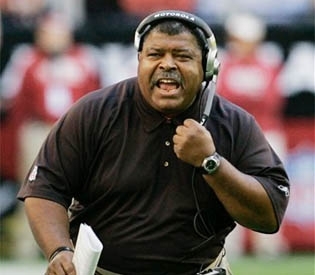 Romeo Crennel was extremely unsuccessful at his only other head coaching position with the Cleveland Browns, posting an unimpressive record of 24 and 40. Crennel is a great defensive coordinator, but he has proven that he is no head coach. The Chiefs should have left Crennel at defensive coordinator, which he excels at, and hired a new head coach who possibly had a more offensive mind. None of these things will matter, however, unless the owners of the Chiefs spend some money to get some real players in here, which we all know will never happen. As we at Kansas City News pointed out weeks ago, the hiring of the head coach was the least important thing on the Chiefs to-do list. The Chiefs owners need to put up money first and foremost - that's it. Without some marquis players on the team, The Chiefs will have as much chance of winning a playoff game as the Royals, who are in the same position - no money spent on players, just put in the pockets of the owners. If the Chiefs actually did put up some money for some quality players, then the next thing that we need to acquire is a decent offensive line. Don't even think about a quarterback until you have secured a competitive offensive line. After the 0-line is secured, then we can start thinking about a real quarterback, not some old hack qb that can barely move around in the pocket like Orton. Orton was just a grasp at desperation, and Matt Cassel is nothing more than a high paid back up quarterback. Although getting a new head coach was on the list for The Kansas City Chiefs, it was definitely not one of the high priorities. The Indianapolis Colts proved for over 10 years that you don't need a head coach to win, Peyton Manning and a great offensive line is how you win games. Their head coach didn't do ANYTHING but stand on the sidelines and work for a very low salary. Let's see if the Chiefs put up money to build an offensive line and go out and get a real quarterback before we even worry about what impact Romeo Crennel will make. The Kansas City Chiefs had found a great defensive coordinator in Romeo Crennel, but a head coach he is not. I think that coach Crennel will do a good job. It's the offensive line and the quarterback that we need to improve on. Kansas City Chiefs, see you in 2012! Len Dawson said on the news tonight when asked who he wanted to win the Super Bowl and he said The Kansas City Chiefs. Go Lenny! We love you baby. Well, the Chiefs picked up a special teams coach today...I guess that was important? ?